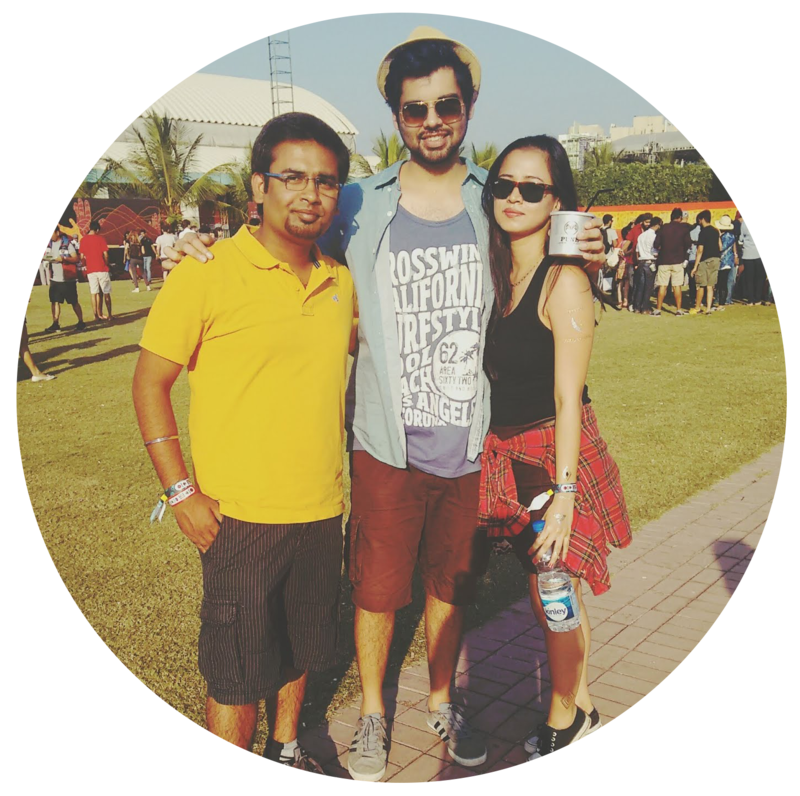 We walked into Bombay Diaries one Sunday evening not knowing what was in store. Was it a Bombay themed restaurant? Was the cuisine like? Could I survive the journey all the way from Wakad to Bund Garden? 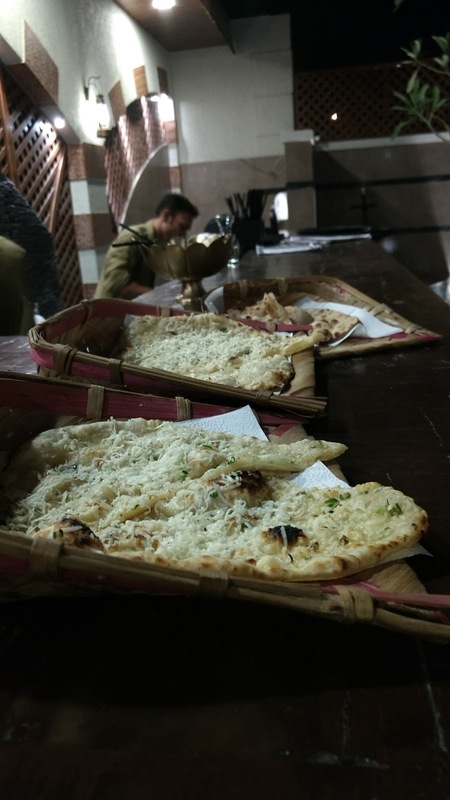 Okay the last one was because I live in the unofficial yet popularly thought, far-flung area of Pune with a characteristically hectic trafficked roads topped to the fact that I was low-key starving (Which is perhaps my perpetual state of existence). When we arrived at the gates of this beautiful restaurant, it was dinner time but I couldn't help but notice how beautiful the property looked. 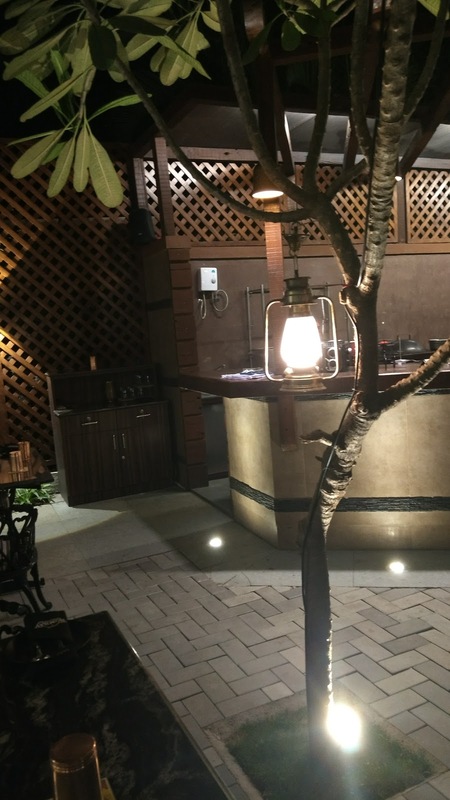 The restaurant has an all-open air seating under the canopy of the leafy trees and beautiful twinkly lights. To save the patrons from the suddenly brutal sun's wrath, Bombay Diaries only operates after 5 pm. Plus they also have a stage with live music almost every day. That's a good addition for a nice, dreamy candle lit dinner, if you were asking. Another fun thing was all the servers were dressed as the Mumbai Taxi drivers. Uniforms and all! And the ones taking orders were dressed as the Traffic Policemen. That kept me amused for longer time than I'd like to admit. Chef Deepu of Cafe Mestizo was in attendance and he was gracious enough to join us for the evening as he helped us pick the dishes and smile untiringly to our crappy jokes. So as he led us through the evening of gluttony, he specified that the food here is mostly North Indian. 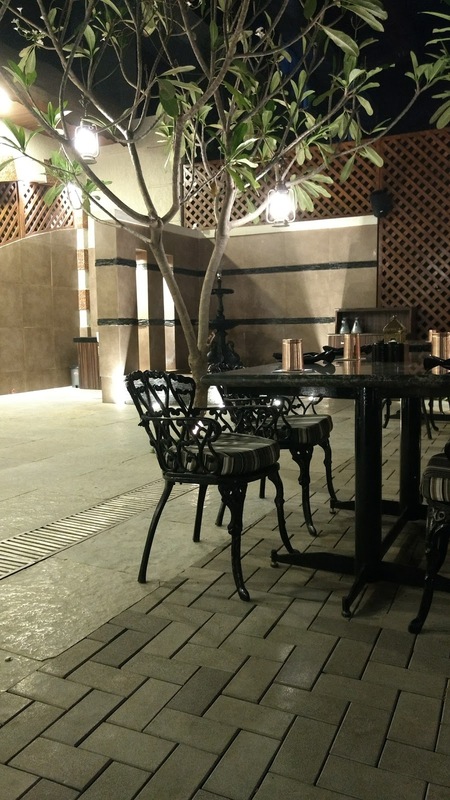 The place has tried to adopt a Mumbai themed vibe but in essence you get served mind-blowing North Indian food. You may choose to visit here with bae or bae-stfriends (haha, I'm so clever...not) for a fancy yet not heavy-on-the-pocket weekend dinner. The lights and decor are gorgeous. The live band adds to the mood with all the lovely music. 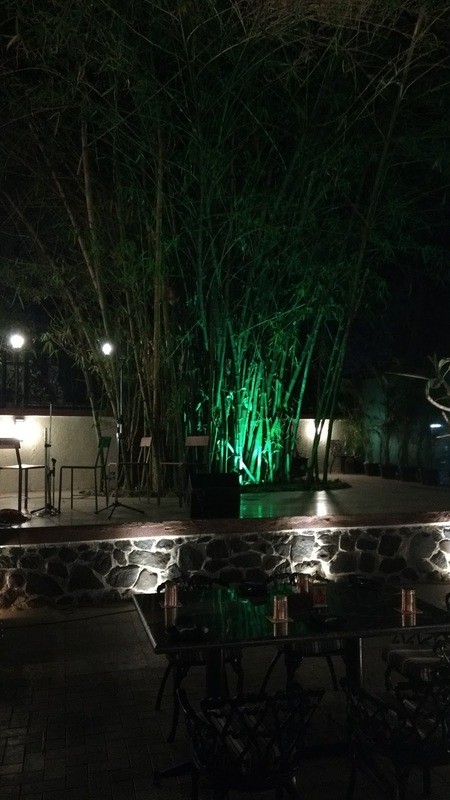 All you have to do is let the pleasant evening-Pune weather do the magic. If you come here and don't try this, I'm done with you. These cocktails were so cutely packaged I had them possessively cradling them for the rest to the evening at the risk of the Chef probably dismissing me as slightly mentally deranged. My favorite ones were the Chulbul which was a Kala Khatta flavored cocktail and the Chikni Chameli which was a strawberry and cucumber mix. 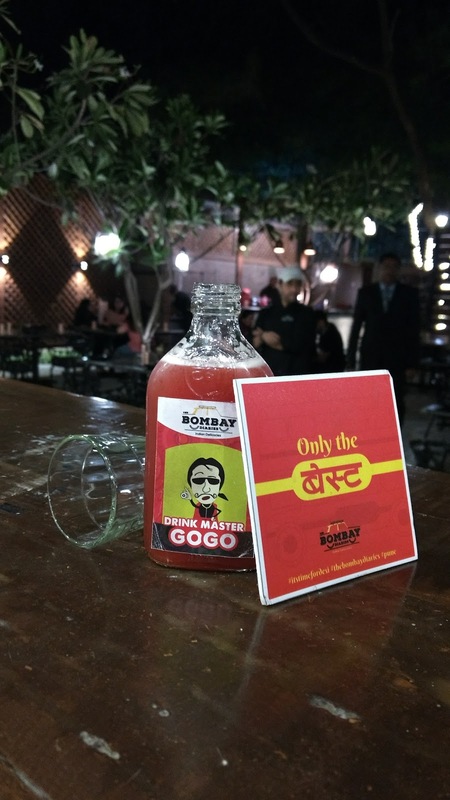 The bottled drinks came in fun names such DRINK MASTER GOGO, BOMBAY THUMAKDA and BOL BACCHAN, you can hardly stop at one. 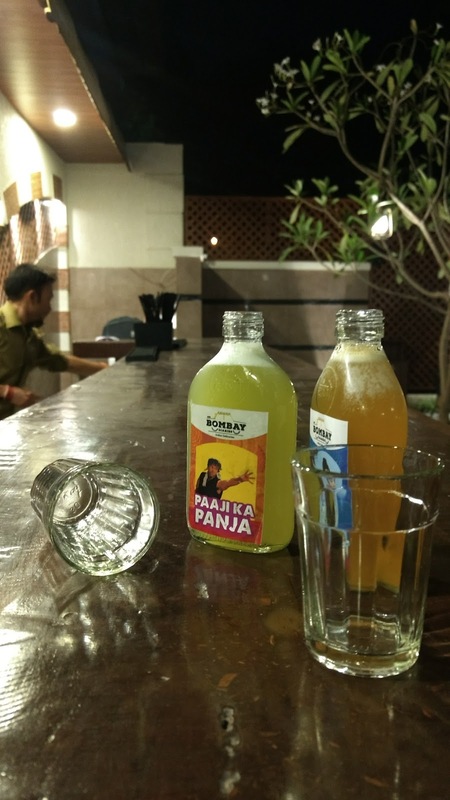 The Bombay Diaries tries to bring classic drinks with desi twist on it. 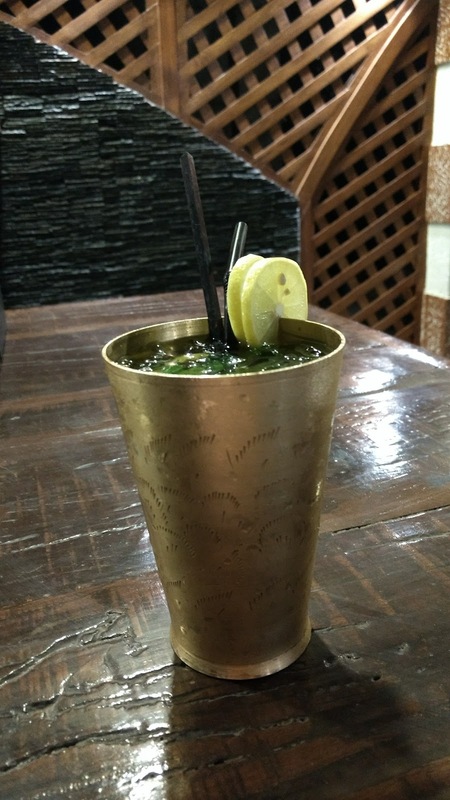 Bollywood-ized cocktails and mocktails include gems like DESI WALA MOJITO, RANGEELA DRIVER and 12 KA PAANA. 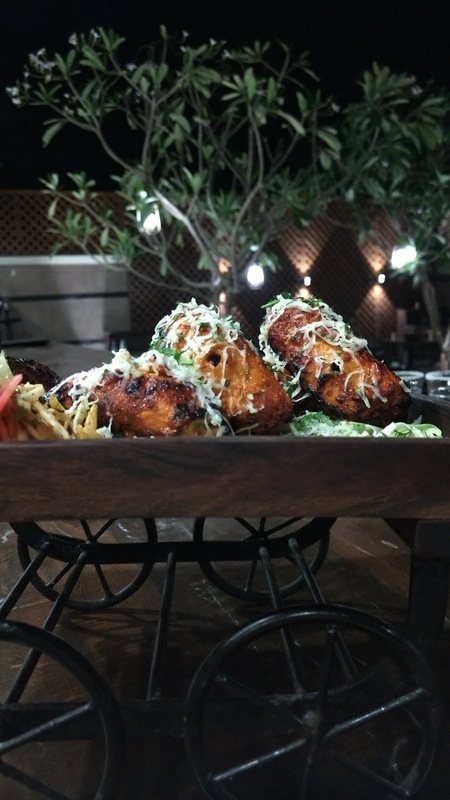 Everything has a splash of Indian twist in it. Be it a bit of jaggery here or a dribble of rooh afza there, everything comes down to refreshing amalgamation of delicious drinks. 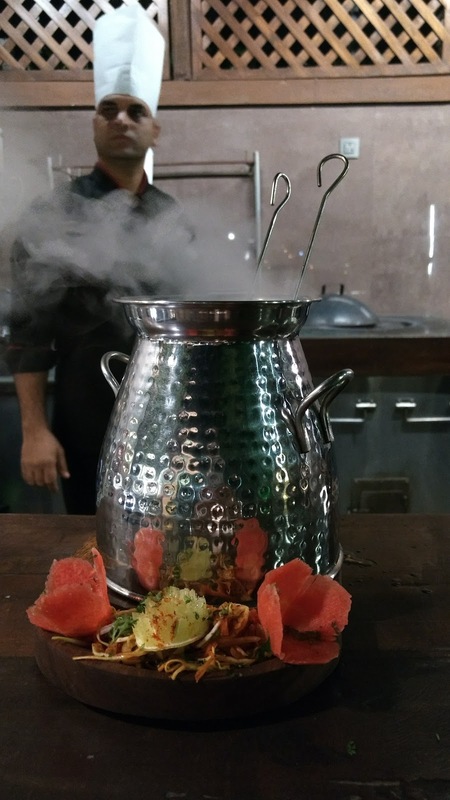 Being in a restaurant belonging to a chef of Chef Deepu's caliber with Chef Deepu, means he went all out with the choicest of the appetizers from his menu. Each one of them had its own unique style of preparation and taste, but stood in solidarity to the exquisite taste. My pick of the night would have to be MUTTON SEEKH LUCKHNOWI among others. The skewered kebabs were placed inside a vessel along with smoking coal embers. The end result was succulent meaty kebab with exquisite smoky flavors. We were also partial to the TBD special murg tikka which was spiced so nice, it made us salivate just with the aroma. It helped that the kebab was filled with cheesiness. To be honest though, we hardly think that you'd go wrong with anything on that menu. As a food blogger, at the end everything boils down to this thing in particular, the grub. Everything else are frills, nice and enjoyable but still frills at the best. 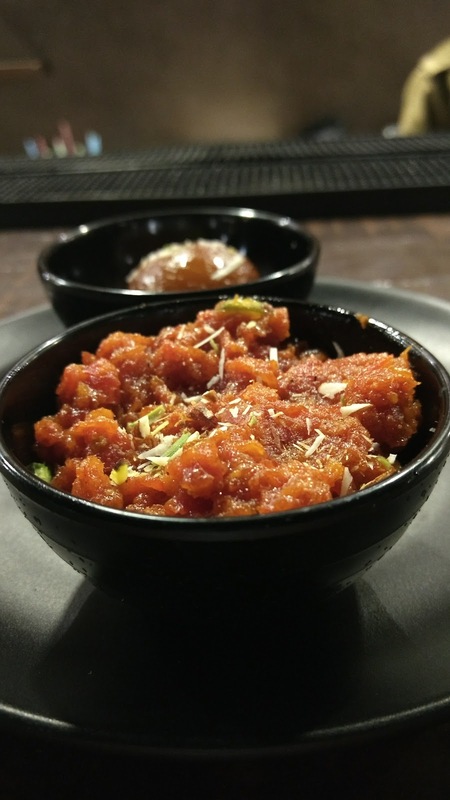 But the food at TBD was one gastronomic journey through the North Indian cuisine. KURKURI BHINDI MASALA was the dish that piqued our interest and it was delicious. It was spicy bhindi cooked in gravy and topped with crunchy bhindi crisps. Inspired! The DAL BUKHARA was another of our favorite with pulses slow cooked till creamy. Went so deliciously with the tandoori roti. Well, the vegetarian dishes were so amazing it really paved the way to just as brilliantly prepared non-vegetarian ones. 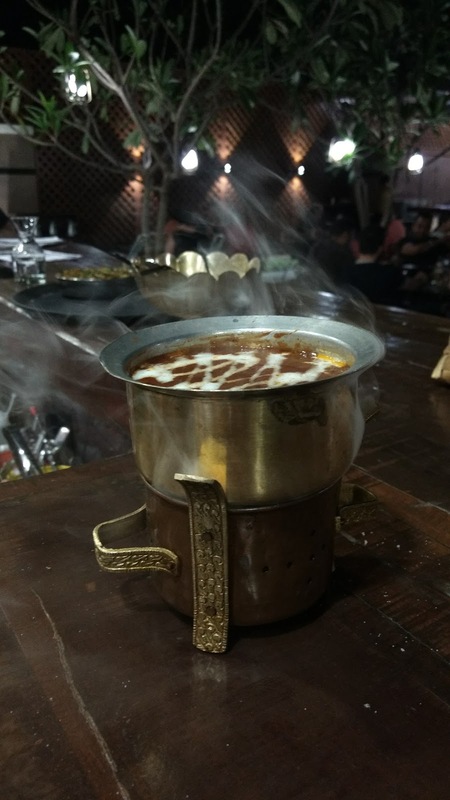 You would want to try the NALLI NIHARI and the MURG ADRAKI to find out why we are raving about the food. As we conclude this list, we invite you to go and make your own little food adventure and let us know what we missed. We loved our jaunts to this place and we are sure you will too! 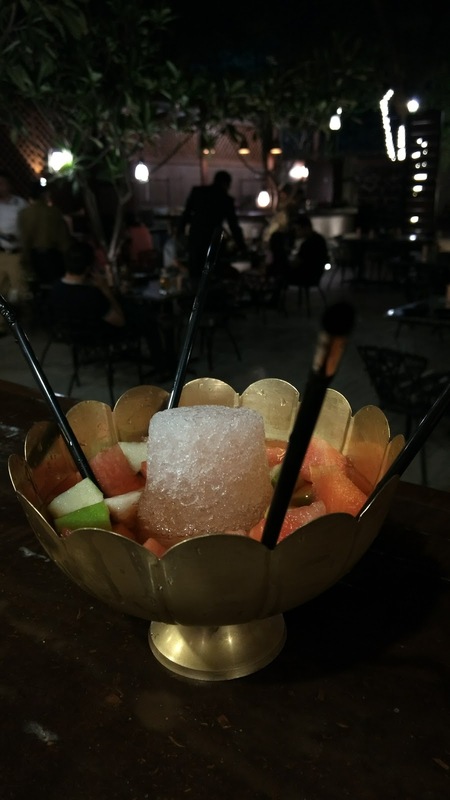 Visited the place a couple of weeks ago..the cocktails and kebabs here surely make your day!